Join us in the sandbox. to make your own Zine! There will be a brief 15-minute tutorial going over equipment we’ll be using. The rest of the hour is dedicated to creating an awesome piece to take home with you. 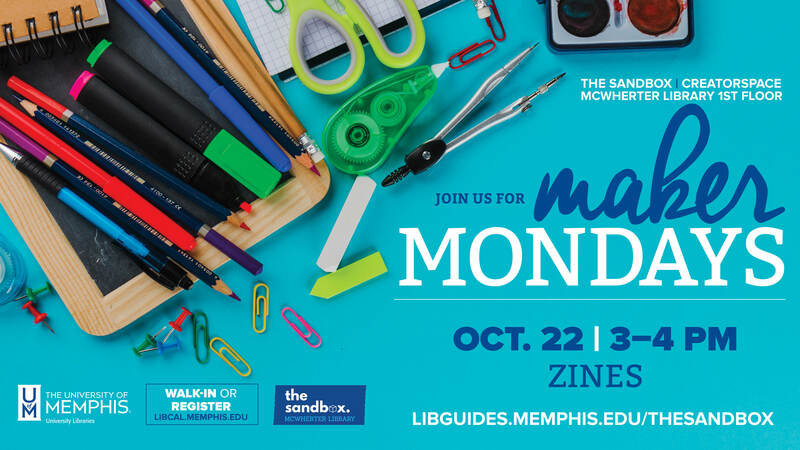 Contact Brannen Varner, bvvarner@memphis.edu, 901-678-8207 with any questions. Thanks for your interest in our research consultation. I look forward to working with you on your research! University Libraries has a ton to offer, so it helps to have someone show you the ropes! If my availability doesn't work with yours, email me at bvvarner@memphis.edu.